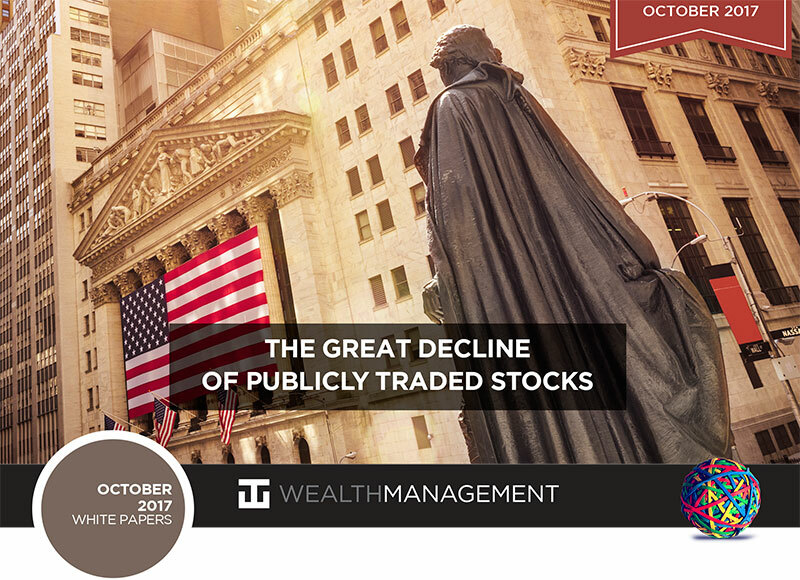 The steep decline in the number of U.S. publicly traded companies has resulted in fewer quality opportunities, particularly for small-cap investors. Small-cap stock indexes have experienced a structural deterioration in quality. This is reflected in the number of companies with negative earnings and lower returns on equity and invested capital. The sluggish pace of initial public offerings (IPOs) in recent years has not offset the loss of attractive smaller companies in the public market. The combination of relatively high valuations and reduction in quality and liquidity in small-cap indexes poses significant risks for passive investors. The stock market's impressive gains in recent years have masked a less encouraging trend: the number of public companies has been cut by more than half over the past two decades. This incredibly shrinking stock market poses challenges for investors, particularly those investing in small-cap stocks. The number of public companies in the Wilshire 5000 Total Market Index-widely regarded as the best single measure of the U.S. equity market has fallen from a peak of 7,562 in July 1998 to just 3,465 as of June 2017. The Wilshire 5000 has not included 5,000 stocks since the end of 2005. Not only are fewer public companies issuing shares, but the total number of shares traded on the market has also declined. Record-low interest rates and slow economic growth encourage companies to buy back their own shares, further reducing the availability of equity shares that remain public. a number of corporate failures. Larger companies have been buying out smaller ones at hefty premiums in an effort to meet growth targets, aided by low interest rates. Strategic buyers are not the only buyers: private-equity funds have ample capital to deploy as well. Motivation also exists on the sellers' side. Increased regulatory burdens and compliance costs stemming from the Sarbanes-Oxley Act of 2002 have dampened desires to go-or remain-public. The ongoing cost of being a publicly held company-including legal, compliance and technology expenses-can approach $10 million. The rise of activism by hedge funds and other investors pressuring management to achieve better results is encouraging some public companies to sell out to private investors, while also discouraging private companies from going public. Corporate leaders don't want to subject themselves to such scrutiny, especially when they can often obtain money to expand elsewhere. As more public companies are acquired or sell out to private investors, we have seen a dearth of new IPOs to replace them. IPO activity has fallen by more than half since peaking in the late 1990s and has steady declined in recent years; the pace of this downturn has accelerated this year. This IPO activity reduction has been partially caused by a surge in venture capital investment, which has enabled startups to expand and access capital while avoiding the public market's scrutiny and transparency. By the time some firms go public, they have grown beyond small-cap managers' reach. The median age of companies executing an IPO has increased from 7.8 years during the 1976-1996 period to 10.7 years in the 1997-2016 period-a 37% increase, according to Credit Suisse. The shrinking equity market has had a disproportionate impact on the small-cap Russell 2000 Index. While the index is rebalanced annually in June to include 2,000 names, the companies recently added to the index have tended to be smaller, more illiquid, and of lower quality than those they replaced. The index includes older names that have been there for years, as well as those that have fallen out of the midand large-cap universes. This has masked a steady increase in lower-quality firms populating the bottom tier of the Russell 2000 companies. The erosion in the index's quality is reflected in Figure 3, which shows that about one-third of the companies in the index have not earned money in the past 12 months, a level normally seen only in recessions. Companies with negative earnings are more likely to struggle to generate the cash necessary to maintain solvency internally, so they may need to raise capital by increasing leverage or issuing additional stock to fund their operations. Also, debt levels, as measured by debt-to-equity ratios, have risen over the past decade. Returns on equity and invested capital of the Russell 2000 companies are dramatically lower than they were 20 years ago. While active portfolio managers may look more skeptically at the index's lower-quality members, passive products such as exchange-traded funds and index funds have been the natural buyer of their shares, aided by the flood of money into passive products. This has helped drive up the shares of mediocre companies as much as, and sometimes even more than, those of their stronger competitors, posing significant risk for passive investors. That risk is magnified by relatively high valuations for small-cap stocks. At the end of July 2017, the forward price/earnings ratio on the Russell 2000 Index stood at 24x, well above the historical average. In the next sustained market downturn, passive products seeking to sell to fund outflows may have trouble finding buyers for the lower-quality, less liquid stocks in the rush to the exits. Of course, this shrinkage in number and overall quality of the small-cap market amid higher valuations also poses challenges for active managers and investors who are trying to separate the wheat from the chaff and not overpay for it. In this environment, WT Wealth Management has decided that our clients should have minimal exposure to small-cap stock investing, which usually amounts to less than 6-7% of the total portfolio value. We remain confident that our focus on factor-driven ETFs, including those that specialize in small-cap and mid-cap stock investment, should provide some downside protection in a potential downturn, and that our fundamental and patient approach should prove rewarding for our clients over time. While investing in small-cap stocks has become more challenging, we are fortunate to benefit from ETF companies that are spending their time and money on back-testing and exploring new and exciting factorbased ETF strategies, from dividend growers to dividend achievers to low-volatility strategies. We will always continue to ferret out the most attractive opportunities for our clients in an otherwise shrinking market of small-cap stocks. WTWealth Management is a manager of Separately Managed Accounts (SMA). Past performance is no indication of future performance. With SMA's, performance can vary widely from investor to investor as each portfolio is individually constructed and allocation weightings are determined based on economic and market conditions the day the funds are invested. In a SMA you own individual ETFs and as managers we have the freedom and flexibility to tailor the portfolio to address your personal risk tolerance and investment objectives - thus making your account "separate" and distinct from all others we potentially managed. In addition to the normal risks associated with investing, narrowly focused investments, investments in smaller companies, sector ETF's and investments in single countries typically exhibit higher volatility. International, Emerging Market and Frontier Market ETFs investments may involve risk of capital loss from unfavorable fluctuations in currency values, from differences in generally accepted accounting principles or from economic or political instability that other nation's experience. Emerging markets involve heightened risks related to the same factors as well as increased volatility and lower trading volume. Bonds, bond funds and bond ETFs will decrease in value as interest rates rise. A portion of a municipal bond fund's income may be subject to federal or state income taxes or the alternative minimum tax. Capital gains (short and long-term), if any, are subject to capital gains tax. Diversification and asset allocation may not protect against market risk or a loss in your investment.